This special ‘Don Alfonso’ coffee represents the very best of the harvest from the famous Aquiares Estate in Turrialba, Costa Rica. ‘Don Alfonso’ coffees bear the name of Don Alfonso Robelo, patriarch of one of the owning families of the estate who took over farm management in 1992 and made the social welfare of farm workers and the wider community one of his main priorities. Aquiares, one of Costa Rica’s largest and most historic coffee farms, sits high on the fertile slopes of Turrialba Volcano. Producing coffee continuously for over a century, the farm has developed an enduring model for growing high-quality Arabica coffee, protecting a stunning natural setting, and supporting a thriving local community of 1,800 people. Established by British farmers in 1890, Aquiares was one of the first estates to produce and export Costa Rican coffee. In 1971, the farm was purchased by its current owners – three families who have worked together with the farm´s staff and community to implement a modern model of sustainable agriculture. Today, the Estate is the largest continuous coffee farm in Costa Rica, covering 924 hectares, 80% of which is planted under shade-grown Arabica. 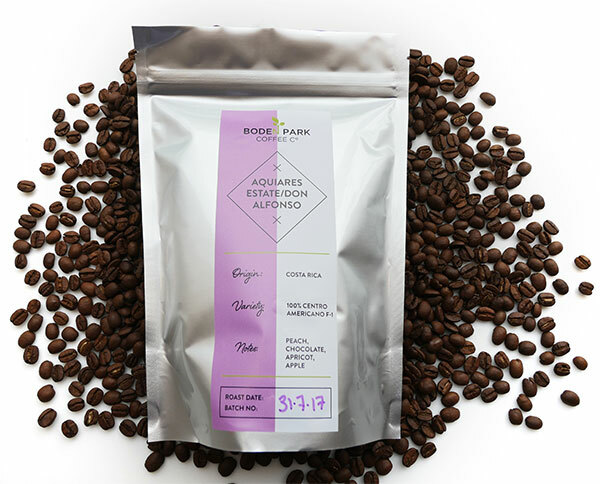 This coffee is 100% ‘Centroamericano’ variety – a hybrid of Rume Sudan and Sarchimor, developed by a variety of different Central American coffee research institutes, that marries high cup quality with high resistance to disease. Aquiares has found the variety very well-suited to the farm’s high elevation (grown above 1,200 meters in most cases) and as consistently yielding a quality cup. All Aquiares coffee is picked by hand to ensure consistent high quality. Microlots, such as this one, are picked by a special team of skilled harvesters who are paid well above the daily rate for their exceptional skill in picking the ripest cherries at each pass. Each tree is visited up to seven times during the harvest to ensure that only fully red ripe cherries are picked. The skilled hands of the pickers represent the farm’s most valuable asset. Pickers hail from the community of Aquiares, nearby towns, and even from the neighbouring country of Nicaragua. The farm ensures that all workers have a safe work environment and a comfortable place to live. Workers coming from further away can live in on-site housing and use a children’s day-care. The farm sponsors doctors’ visits for pickers and their families twice a week where nutritional health advice is also given. To take better care of its field workers, Aquiares has established first-of-its-kind physical therapy sessions and also a daily warm-up routine of exercise before work. Many pickers return each year, confirming success in providing a secure home in Aquiares.